My responsibilities include supporting the projects of Community Fellows and Mentors, planning events and workshops, advancing program communications and outreach, and facilitating transportation solutions. What I like most about my job is that I get to help increase college awareness outside the gates of the College and to coordinate college visits. This semester, Mount Holyoke welcomed several groups of middle and high school students. They visited the Equestrian Center, the Kendall Sports and Dance complex, and various academic buildings. They also had the chance to attend cultural events on campus. These visits, organized by CBL Community Fellows, let our guests experience what it’s like to be on a college campus. And more importantly, visitors get the chance to envision themselves as college students. 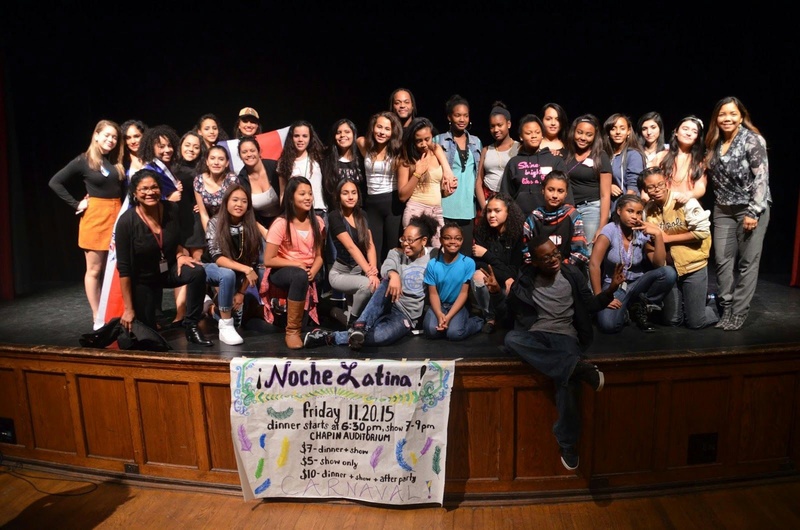 For example, a group of students came recently for Noche Latina, which is La Unidad’s annual cultural event. La Unidad is a campus organization for those who self-identify as Latina and who identify with the culture and language of Latin American countries—as well as their allies. Members come together to express their identities through cultural, educational, and social activities. Noche Latina happens every year in the fall, and this year our student visitors ended up dancing on stage with the performers! It was amazing to see them having such good time; we are already thinking about how we can make another visit happen! Campus visits are only a small portion of CBL work. The department supports a wide range of programs that allow Mount Holyoke students to be more engaged with nearby communities—including South Hadley, Holyoke, Springfield, and Chicopee—and to participate in effective social change. Become a Community Fellow. You will participate in a paid academic-year internship to develop and apply leadership and organizing skills at an organization in the Pioneer Valley. For example, one MHC student used a pop-up shop to teach economic literacy to teenage girls at Girls, Inc.! Become a Spanish Corps Interpreter. You will serve as an interpreter for IEP (Individualized Education Plan) meetings in the Holyoke Public Schools with parents and school staff; assist in making phone calls home to parents who only speak Spanish; and help translate materials. Take a CBL course. The goal here is integration. CBL courses integrate students’ experiential learning in area communities with rigorous study of theory and content knowledge specific to academic disciplines. Volunteer. Many students choose to volunteer as tutors! Take part in off-campus work/study. Student tutors can also be placed in area schools to assist children in grades K–8 during in-school and after-school programs, as part of the America Reads/America Counts Tutor Program. Being a student at Mount Holyoke is so much more rewarding when you engage with people beyond campus. Being an Administrative Fellow is not just a cool on-campus job; it’s also an amazing opportunity to make a difference in the Pioneer Valley! Interested in communities that take action?